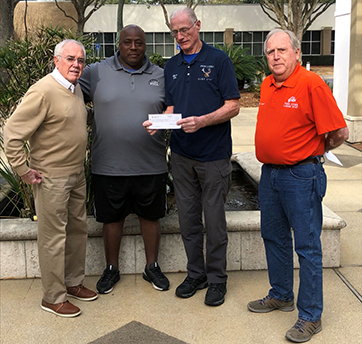 Twin Cities Elks Lodge # 2747 Exalted Ruler, Rick Woelfl, presented the lodge’s Elks National Foundation Anniversary Grant of $1,500 to Cornell Tinner, president of the Niceville Little League Football organization. Also present were city manager, Lannie Corbin, and Lodge Secretary, Gary Pelham. The donation will assist in funding lighting improvements at the City of Niceville Sports Complex. Warrington Elks Lodge Exalted Ruler, Rick Wright, secured a grant that allowed the lodge to donate 150 smoke alarms to the fire department which planned to install them in the homes of those who needed them. Also, in conjunction with this program, the lodge had officers and the drug dogs at the lodge and gave away drug awareness literature and items to children. With that in mind, lodge trustee Phil Gambrell was charged with finding a charity that could quickly get the funds in the hands of those families and individuals most affected by the storm. 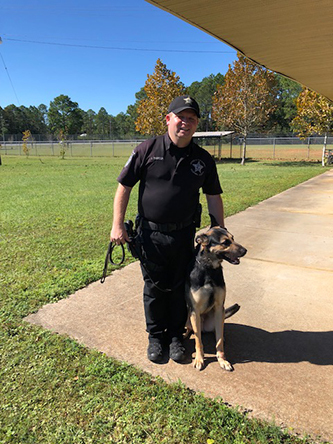 Gambrell contacted Rodney Anderson, EMS Director in Jackson County, who highly recommended the Chipola Family Ministries in Marianna, Fla., that was doing a lot for the people of the surrounding communities to get back on their feet. 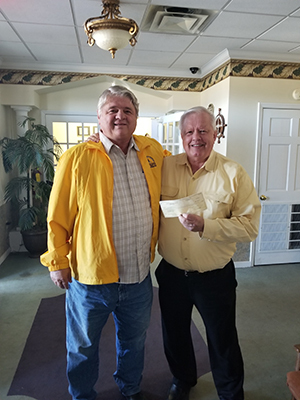 Pensacola Beach Lodge trustee Phil Gambrell, right, presents a check for over $6,000 to Coba Beasley, Director of Chipola Family Ministries, for Hurricane Michael relief. On Dec. 15 with the help of Elwood Banks and Eric Long, Warrington Lodge #2108 held a party with admission being an unwrapped toy. 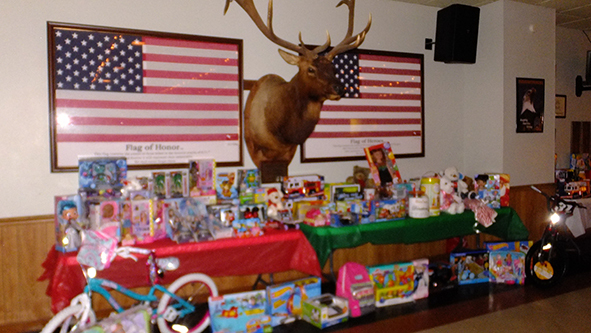 Over 275 toys were collected and $230 was received and used to buy gift cards for the older children. Everyone enjoyed good music and good food. The toys were given to children in the foster care system. 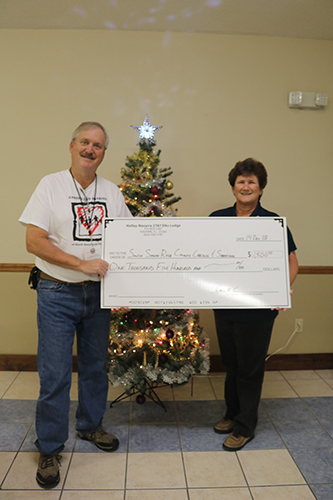 On Dec. 14, Holley-Navarre Elks Lodge #2787 presented a check for $1,500 to Caring and Sharing of South Santa Rosa County, a 501c(3) nonprofit organization that provides food baskets at Thanksgiving and Christmas as well as other assistance to South Santa Rosa families. The total included $500 from an Elks National Foundation Anniversary Grant and $1,000 from the lodge charity account which is sourced predominately from the lodge’s weekly bingo that is open to the local community. The lodge held the check presentation prior to bingo to thank the public for their continued support throughout the year and give them an opportunity to see how proceeds from their patronage are used. Chuck Howard, Caring and Sharing representative, accepts a donation from Holley-Navarre Lodge presented by Kris Kane, Exalted Ruler, Dec. 14 at the lodge. 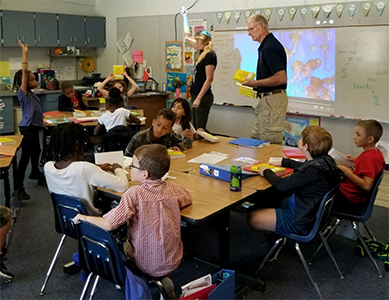 Rick Woelfl (pictured), Twin Cities Elks Lodge Exalted Ruler, and Joe Arthur, Leading Knight, deliver dictionaries to third-graders at Eglin School Oct. 26. The first batch of dictionaries for third-grade students in six schools were delivered Oct. 26. In all, the lodge will distribute about 600 dictionaries; the lodge does this every year. Tom Casey, Trustee, and Kathy Casey, Tiler, delivered dictionaries to other schools. Pensacola Beach Elks Lodge #497 hosted an impromptu wedding for two Hurricane Michael evacuees Oct. 22. The lodge use was gifted to the couple at no cost to them and everything was donated by members. To view the article that appeared in Pensacola News Journal, click here: https://www.pnj.com/story/news/local/2018/10/22/panama-city-couple-marries-gulf-breeze-after-michael-destroys-home/1728097002/. 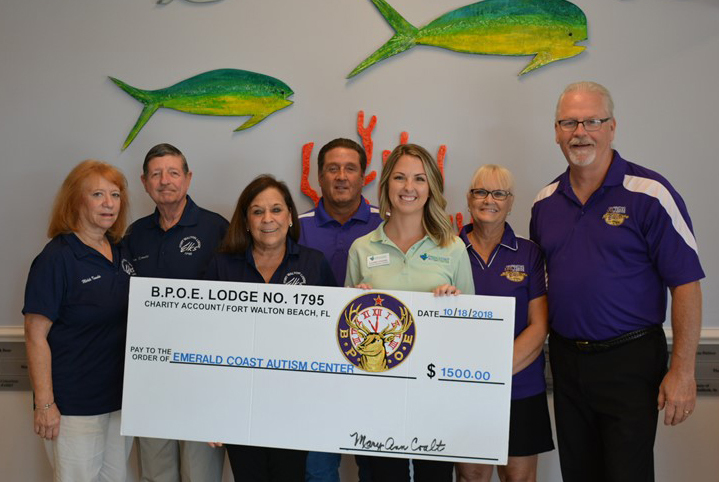 Fort Walton Elks Lodge #1795 presented a $1,500 Elks National Foundation Anniversary Grant to Emerald Coast Autism Center to help with much needed school supplies. Michelle Knowles; Tom Knowles, PER; Jamie Clemons, Lodge Secretary; Kevin Clemons, PDD; Lauren Cooper, ECAC Community Relations Coordinator; Colette Willey, Chaplain; and Paul Willey, Exalted Ruler, take part in the check presentation Oct. 18. 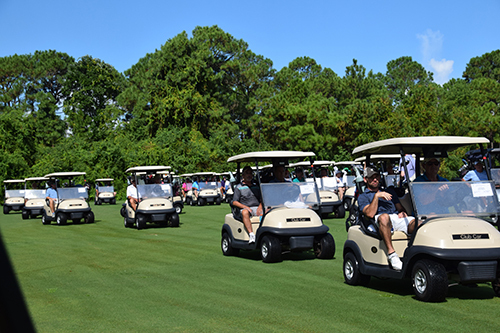 The 2018 Northwest District Past Exalted Ruler Golf Tournament was held Sept. 9 at Regatta Bay Golf and Country Club and was a great success. This district event had 21 teams from all seven district lodges and their local communities and raised over $6,098. In addition, local community leaders, businesses, the PER Association, district lodges and individual Elks provided 26 hole sponsorships that raised $4,600 for a total of $10,698. Tournament staff included Ann Moore (District VP), Scott Turner, Caroleen Swanson, Gary Pelham, Patti McAndrew, Tammy Kuhn, PER Kim Sayer, Jerri Jones, Marilyn Roach, Kim Cauley, Linda Turner, Debra Wolfenden, Paul Palmer, David Cagle and Jim Wright. The annual Northwest District Kids on the Water event was held at Fort Walton Beach Elks Lodge #1795 for the fifth consecutive year. Pensacola Beach, Destin, Crestview, Warrington and Twin Cities lodges participated as well. 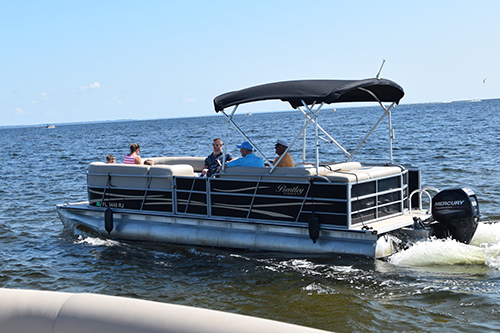 Members Danny and Karen Bilger donated the pontoon boats that toured Choctawhatchee Bay. Entertainment was provided by Reid Soria and Captain Davy the Pirate. Face painting, rock art, gifts for all and food made for an enjoyable day. There were 64 volunteers, 169 guests and 86 military guests for a total of 319 participants. 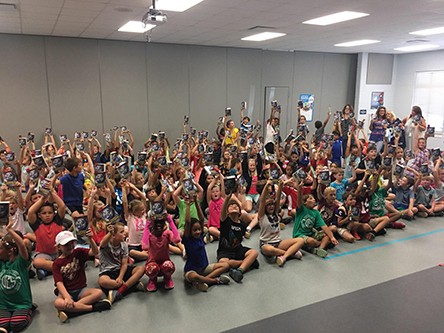 On Sept. 21, Destin Elks Lodge distributed 334 dictionaries to Destin Elementary using funds from a Gratitude Grant from Elks National Foundation. 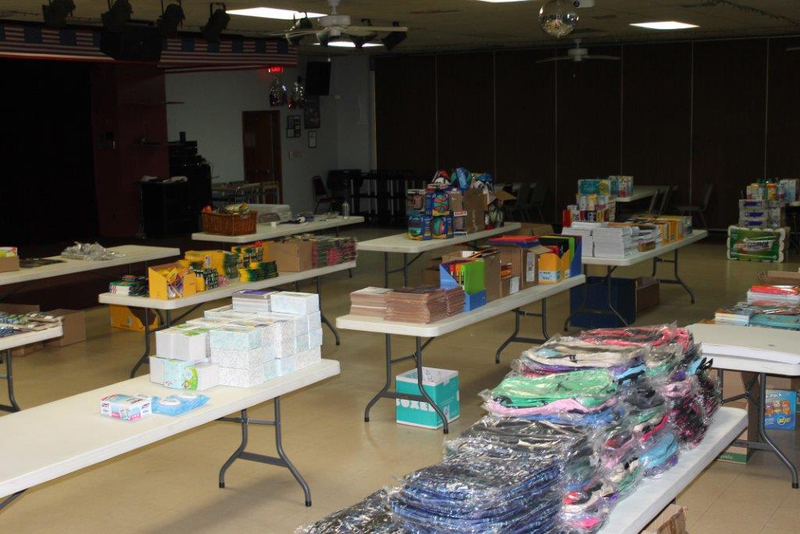 Warrington Elks Lodge #2108 held another Tools for Teachers event July 10 at the lodge for teachers to come and select school supplies needed for their classrooms. The lodge members had been amazed by the willingness of teachers to reach into their own pockets to purchase additional supplies for their students and wanted to help. Grant Chairman, Linda Erickson, submitted a request for and received a $2,000 Gratitude Grant from the Elks National Foundation. The membership also approved spending an additional $2,000 from the charity account to support the project. Becky Stokes led the effort as chairman and filled her house with all the supplies she was able to purchase. Stokes’ helpers were Rick Wright, Exalted Ruler; Dot Penton, Leading Knight; Pat Prendergast, Loyal Knight; Ann Lewis; Dave Pierce, Trustee; Paul Palmer, PDD; Toni Palmer, PER; and Barbara Steward, Treasurer. Teachers from kindergarten through fifth grade at Navy Point, Myrtle Grove, Montclair and Bellview schools attended. The four schools were given a certain amount of supplies to split between all the teachers, and then they went to the tables and picked up what they needed for their particular grades. A wide variety of items were available including pencils and bookbags to snacks and basketballs. The teachers truly appreciated everything, and it was a rewarding experience for the lodge knowing they were able to help their community.